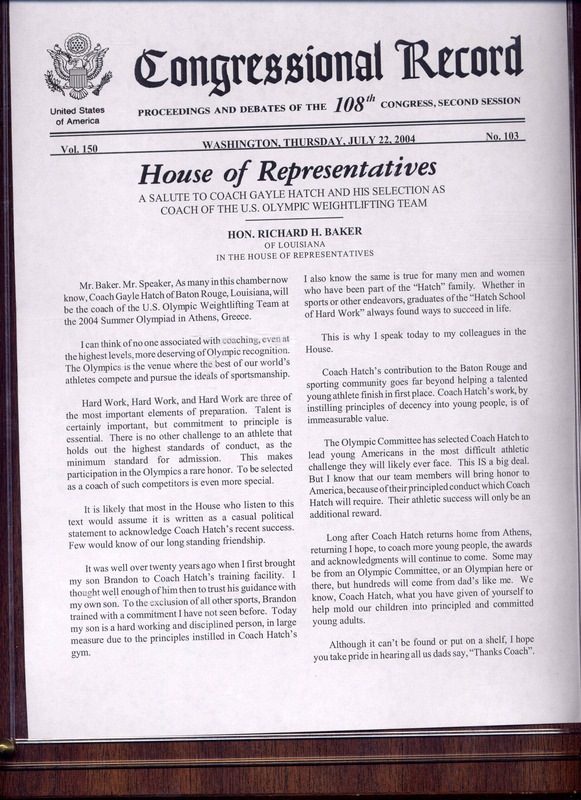 An American flag was presented to Coach Hatch by the Honorable Richard Baker, Member of Congress. The flag was flown over the United States Capitol at the the request of Congressman Baker to salute Coach Gayle Hatch's selection as Head Coach of the Men's U.S.Olympic Weightlifting Team and his leadership of American Olympians in their strive for excellence. The flag was presented to Coach at a banquet honoring him. Former LSU Basketball Coach Dale Brown was the keynote speaker. The following document was entered into the Congressional Record during the 108th Congress, second session in Washington on Thursday, July 22, 2004.